Am Solar is proud to sponsor this article. 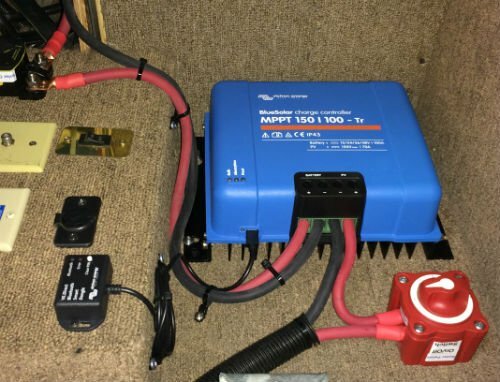 Regulating current flow from solar panels to a battery bank on your RV solar system via a charge controller system is essential when relying on the sun to power your on board systems. Whether you’re dry camping off the grid or there are limited electrical services at a campground, knowing you have the power when you need it means a peace of mind at your destination. 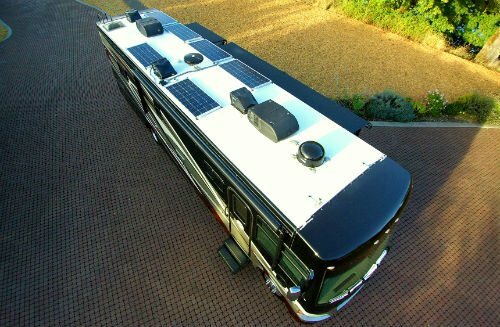 The heart of any solar system in an RV is the charge controller. It simply regulates, maintains, and sends the proper voltage to the batteries. What does a charge controller system do? While charger controllers are nothing new, some features available to RVers are. What you need to know about RV solar power systems and charge controllers is how they operate. For instance, they are the heart of any solar system and regulate, maintain, and send the proper voltage and current from the panels to the batteries. Read more about RV lithium batteries. 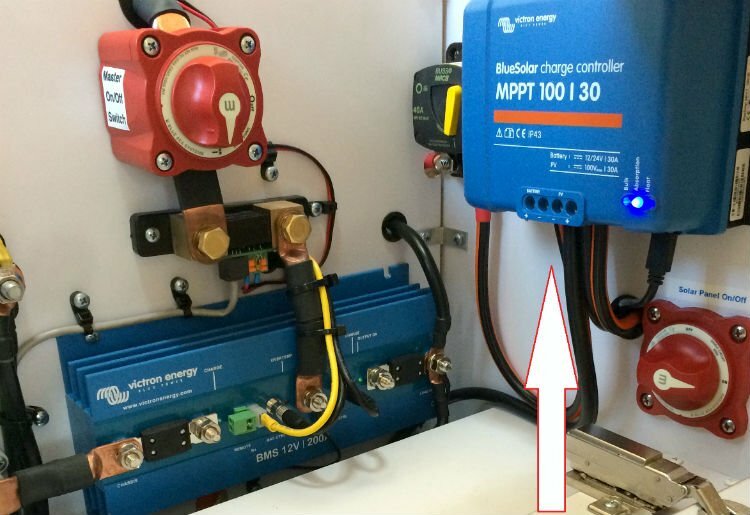 “The Charge Controller is an essential part of any solar power system,” says Mitchell Boyer, Systems Engineer for AM Solar, which offers the Victron Energy Blue Solar Maximum Power Point Tracking (MPPT) Charge Controller. “Power from the solar panels is at a higher voltage than what would efficiently charge your batteries. So, an MPPT charge controller transforms that high voltage and low current into a lower voltage with higher current. The Victron Charge Controller also integrates with the Victron Color Control Monitor Kit, which displays a variety of data. What different types of controllers are there? While charger controllers are nothing new, some features available to RVers are. For instance, according to Boyer, Pulse Width Modulation (PWM) charge controllers are the most common and, most economical. They tie solar panels directly to the batteries in a pulsed connection with a pulse width that varies depending on the charge status. Further, Maximum Power Point Tracking (MPPT) charge controllers are a newer, more advanced technology. Boyer explains one of the key advantages with the MPPT controller is they step down the voltage and boost the current. This means the solar panel can operate more efficiently and produce about 20 percent more power (on average). A convenient highlight is information collects in the controller and is forwarded to Victron’s VRM online portal. Victron MPPT charge controllers are available in 15-, 30-, 50-, 70- and 100-amp models that all function similarly except for their current capacity. To approximate the charging current of a system, simply divide the wattage of the solar system by 12V and multiply it by 90 percent. For instance, with this calculation, a 480W solar system will have a charging current of 36A and need a 50A controller. What’s more is the Victron Charge Controller conveniently integrates with the Victron Color Control Monitor Kit. This is a compact display that relays data from a variety of components. Although it’s not a replacement for a conventional battery monitor, it can communicate with one to relay battery voltage, charge/discharge current, amp-hours, and time remaining at the current rate of discharge. Visual and audible alarms for over/under voltage, and/or battery discharged are other benefits. Ensures that solar panel does not exceed the charge controller’s limit. 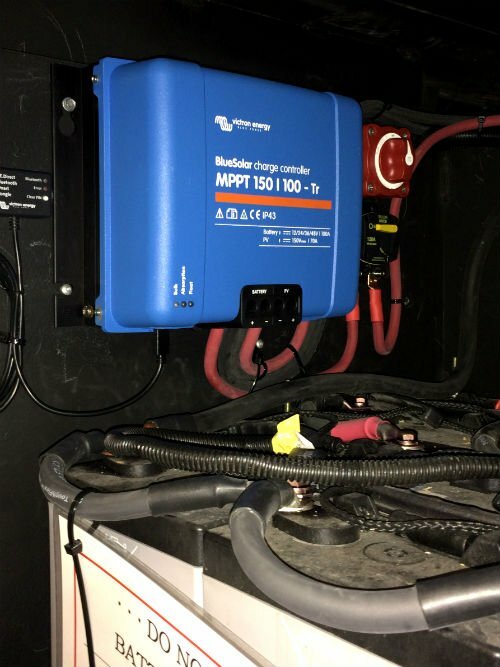 Another plus is the Victron MPPT Charge Controller’s 30-day history function. With this, after a while on the road, you can determine how much power you need. You can also discover where the power is going to and determine it’s use. It even indicates when you start up the generator or hook up to a campground’s electricity. Also, you can download the information for future reference. To look into charge controller options visit AM Solar or contact one of their installers to ensure the right choice for your solar system.